This week, state agencies announced cuts to services and facilities that are the result of the General Fund budget passed in September. 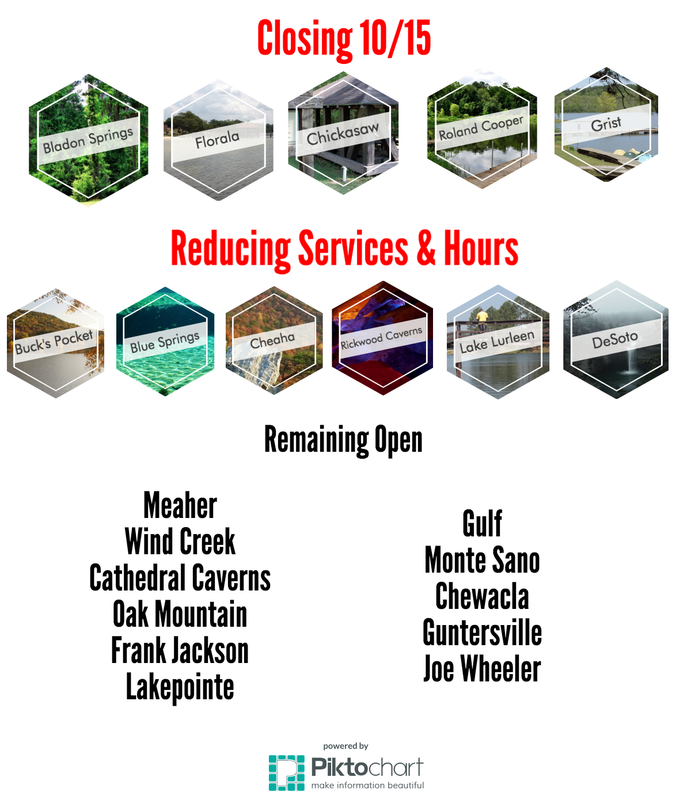 Among the budget’s casualties are five of Alabama’s 22 state parks: Bladon Springs (Choctaw County), Chickasaw (Marengo County), Roland Cooper (Wilcox County), Paul M. Grist (Dallas County), and Florala (Covington County). These parks will close indefinitely on October 15. Six more parks will have their hours and services reduced to save money. Unfortunately, we’ve lost even more than the opportunities the parks provide to spend time outdoors and enjoy Alabama’s natural resources. State Parks Director Greg Lien notes that as a result of these closures, 40-50 park jobs will be eliminated. The parks being closed are in rural areas, and it remains to be seen what kind of economic impact removing the parks will have on the communities that depend on them for the tourism dollars they provide. These park closures are the direct result of legislators transferring money from the Department of Conservation and Natural Resources (DCNR) into the General Fund. These “administrative transfers” have occurred for the last five years, taking money generated from hunting and fishing licenses and park entrance fees from DCNR and delivering it to the General Fund. Even though your outpouring of emails, letters and phone calls reduced this year’s administrative transfer to $3 million instead of the $18 million proposed earlier, DCNR can’t sustain that kind of loss. Since April, more than 4,000 messages were sent to our elected officials telling them how much state parks and public lands matter to our state and how important it is to us that they stay open and accessible. The administrative transfer from DCNR to the General Fund that crippled our state parks was in direct opposition to the public’s wishes. Part of our role at Conservation Alabama is to hold elected officials accountable for the decisions they make, and this will be a top priority for us for the next legislative session and as we prepare for the next statewide elections in 2018. The legislature will return to Montgomery in February for the 2016 legislative session. We expect continued attacks on our state parks and public lands, and we’re already making plans to defend our state’s most beautiful places. Thank you for all you’ve done this year to stand up for Alabama’s state parks, and stay tuned for how to continue the fight.